Synopsis: He's saved her. He's loved her. He's killed for her. Hushed is a unique, beautiful, disturbing, haunting story that left me feeling a wide variety of emotions. 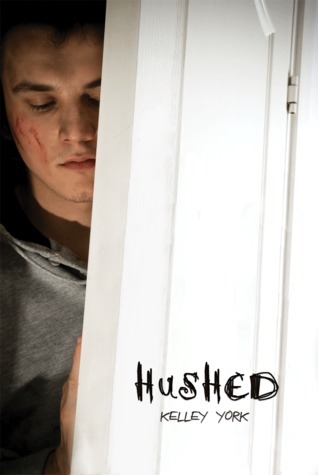 I have to admit that when Stacey from Entangled Publishing emailed me and asked if I’d be interested in reading Hushed, I was equal parts intrigued and wary. I’m not usually much for thrillers, and I hadn’t read any YA books that dealt with GLBT themes, and was curious how that would be handled - not because I don’t like those types of stories, but because any time I’ve read a book where there’s even a gay best friend, he’s always a stereotype and that makes me angry. I quickly discovered I didn’t have to worry about that with Hushed. Archer was an incredible character. My heart ached so much for him. The things he did were so wrong, but he did them out of love and loyalty. He wasn’t a bad person, despite the bad things he did. I never thought I’d be able to sympathize with a murderer, but Archer’s character was so well-developed, I realized it’s not always black and white - there’s a lot of gray. To me, this entire story took part in a gray area. Archer was so misguided, wanting desperately to be loved by Vivian the way he’d always loved her. Everything he did was for her - to keep her safe, to protect her, to get retribution for her. He had such a sick relationship with Vivian, and she had this seemingly unbreakable hold on him. The relationship between Archer and Evan was one of my favorite things about this book. It was interesting watching their relationship blossom - from Archer’s initial resistance, even though there was something about Evan that captivated his attention, to them becoming friends and then more. Evan was the best thing that could have happened to Archer, and their relationship was so achingly sweet. They are one of my new favorite YA couples. ***Spoiler alert*** I had a feeling all along that Archer wouldn’t have to pay for his crimes. In the back of my mind, that bothered me because people should have to pay for their crimes, especially murder. But that’s when that whole black-and-white/gray area thing comes into play again. When it actually came time and Archer could have confessed, I was holding my breath hoping he wouldn’t. He paid in so many other ways - mentally, emotionally, and psychologically, I hated the idea of him ending up in jail away from Evan, who was the one person who kept him grounded. I was very satisfied with the ending, and thought it was fitting. I am dying to read this book. I ran out to Barnes and Nobles the day it came out, only to find they didn't carry it in the store here ( too controversial? )So I am now patiently (not) waiting for it to arrive. Everyone writes that it is amazing! WOW! I've seen this book around on many blogs but never really stopped to read a review! Thank GOD for your blog, sugah! excellent review, you got me really excited. it isn't often that a YA book has a LGBT character that is not a flat and miserable stereotype! I'd love to read this book and will look it up soon! :D Thanks for a wonderful review! I loved Hushed and I completely agree with you on the ending. It was perfect. Great review.